Let's say one of the "real" Vintage Guitar Dealers in Australia had a genuine `62 Strat in this super rare Custom Colour... What would would they charge for it??.. Do I hear $90,000.. do I hear $100,000.. do I hear more from the Investment Banker at the back of the room?? Classic Big headstock Strat reissue in Vintage White from about 10 years ago. In very good-excellent condition.Duncan Vintage SSL-1 in the neck postion, CRL 5 way & Switchcraft output jack fitted. FJ gigbag included. 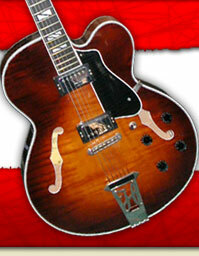 Yes, Sunburst Offset Fenders with Block inlays are still the coolest guitars in the world, ever. Sorry, I can't change the Laws of Nature & The Universe. Fender Japan Used & Vintage ~SOLD~Fender Japan C.I.J. "P" series `57 Precision Bass R.I.
Nice 6-7odd year old example of a model we can never get enough of & never seem to be able to keep in stock long. Feather weight as these usually are.More details to follow. Limited Ed Custom Colour `70 Thinline from Fender Japan. A very cool mix of a maple neck 1st Generation Telecaster Thinline Reissue, painted in a early `80's "International Colour" series Finish - Capri Orange. Absolutely MINT conditon, still has the factory plastic on the back plate. Looks great, as most lefty players would know, we don't get offered much in Candy Apple Red. Plays as good as it looks, the neck profile is perfect, not too fat & not to thin. Lefty-Jazz Bass-Ash Body-Sunburst-black pickguard-flatwounds-BLOCK INLAYS!! No, you can't ask for or need anything more, that's all you ever need. Medium rare?? Medium COOL?? Yep ,this ones a little of both. From the Antigua reissue series Fender Japan did a few years ago, only the 2nd Tele we have had. In near mint condition & of course, plays and sounds like it should. Hey , it's Fender Japan instrument, what else would you expect.